The UN Security Council (UNSC) said it is seeking “clarity” on recent conflicting claims of chemical weapons use near Damascus, adding that humanitarian aid needs to be provided to the victims as soon as possible. “There must be clarity on what happened and the situation must be followed carefully,” UN Permanent Representative of Argentina and President of the Security Council, Maria Cristina Perceval, told reporters after a closed-door emergency meeting of UNSC on Wednesday. “All council members agree that any use of chemical weapons by any side under any circumstances is a violation of international law,” Perceval said, stating that members "welcomed the determination of the secretary general to ensure a thorough, impartial investigation." Eliasson said that whatever the conclusions of the investigation, “this represents a serious escalation with grave humanitarian consequences.” He said the UN hopes its team will be given access to the alleged attack site by the Syrian government. At this point the situation “is very dramatic” and “the security situation does not allow such access. We hope that they will be given access to the area by the Government – there is a requirement of consent in situations like this,” Eliasson stated. France, Britain, the United States, Luxembourg, and South Korea requested the emergency meeting. Thirty-five member states welcomed UN chief Ban Ki-moon's calls for an immediate investigation by the chief UN investigator Ake Sellstrom, whose team is now in Syria. Following the meeting, the UNSC issued no formal statement on the matter. 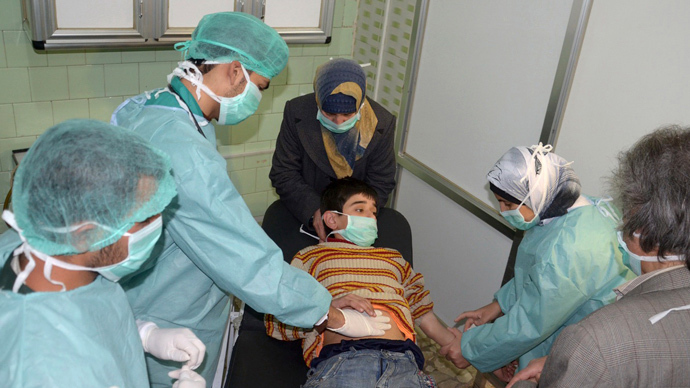 UN inspectors arrived in Damascus on Wednesday to investigate reports of toxic arms use. 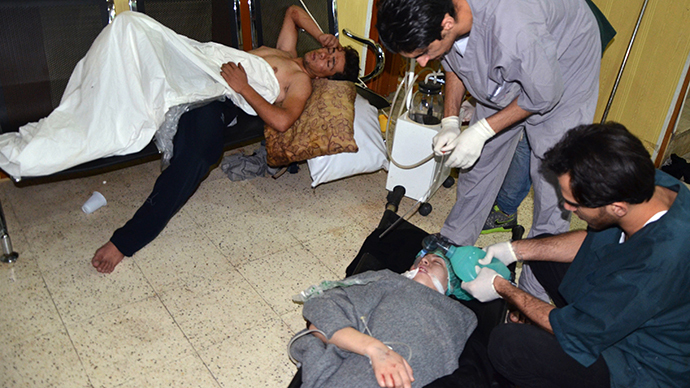 The Syrian opposition has stated that more than 1,300 people were killed in the alleged chemical weapons attack. However, Syrian authorities issued a statement saying there is “no truth whatsoever” to reports of chemical weapons use near Damascus. The Ghouta region is known for its opposition inclinations and has been the site of previous clashes between government forces and rebels. UN Secretary General Ban Ki-moon was shocked by the report of the alleged attack, his press office said. The UK, one of the five permanent members of the body, demanded that the UN team of investigators gets “unrestricted access” to the area of the alleged attack, Foreign Secretary William Hague told reporters. Russia has spoken out on the issue, saying that reports by “biased regional media” about alleged chemical weapons use near Damascus might be “a provocation planned in advance,” Russian Foreign Ministry spokesman Aleksandr Lukashevich said in a Wednesday statement. “A homemade rocket with a poisonous substance that has not been identified yet – one similar to the rocket used by terrorists on March 19 in Khan al-Assal - was fired early on August 21 from a position occupied by the insurgents,” Lukashevich said. Russia believes the incident should be thoroughly investigated by professionals. Moscow urged everyone who has influence on armed extremists to do everything possible to finally put an end to such provocations involving chemical poisonous substances. 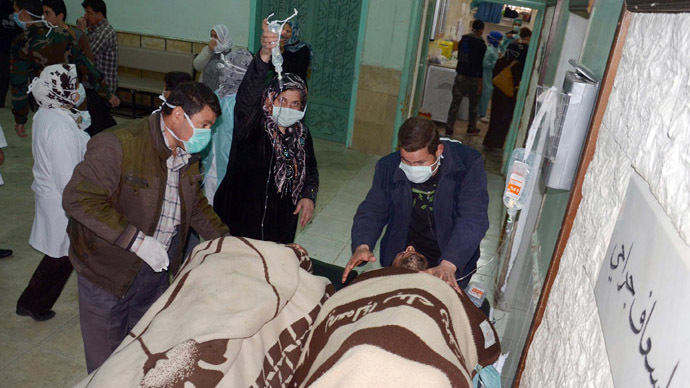 Witnesses outside Damascus described symptoms consistent with the use of chemical weapons, Human Rights Watch reported. “The explosion shook the house. We went to the site and we saw a very big explosion that destroyed several buildings. The buildings were on the ground...Paramedics quickly arrived and people were in a state of hysteria. There was a big cloud of smoke covering the area. Most of us had masks to cover our mouth but they didn’t protect our eyes. Everybody was coughing and some were suffocating. My eyes became red and itchy for hours,” a media activist in the town of Ayn Tarma said. Meanwhile, an RT Arabic correspondent managed to contact locals who said they had not witnessed any “poisonous attack” in the area. They did point out, however, that gunfire could be heard. Some experts believe that even if the attack did take place, it is still too early to blame the Syrian government. UK-based geopolitical analyst Patrick Henningsen told RT that the opposition is the side that would benefit from a chemical attack.